I have been feeling a little neutral for several years now. and even a hint of rustic with those burlap panels in the cottage. 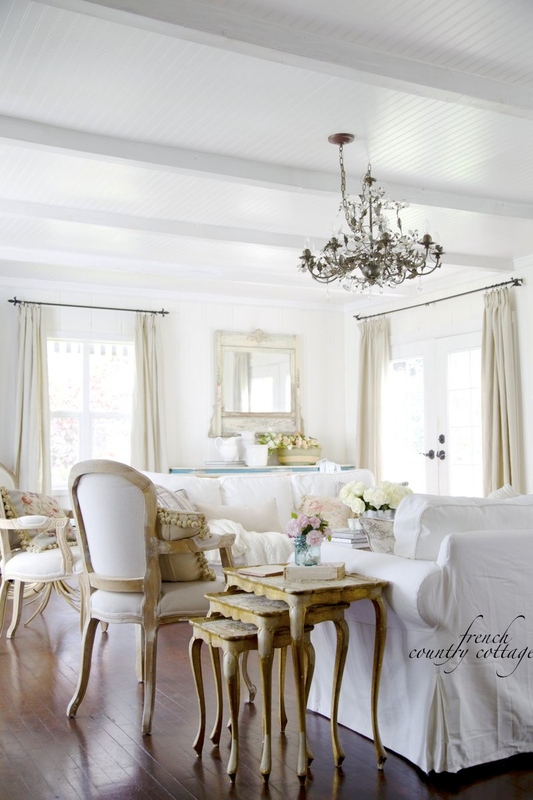 I do love mostly neutral and quiet rooms and designs. to speak much more than the furnishings. when bringing any new pieces home recently to keep the subtle and quiet vibe. and ran off with it. 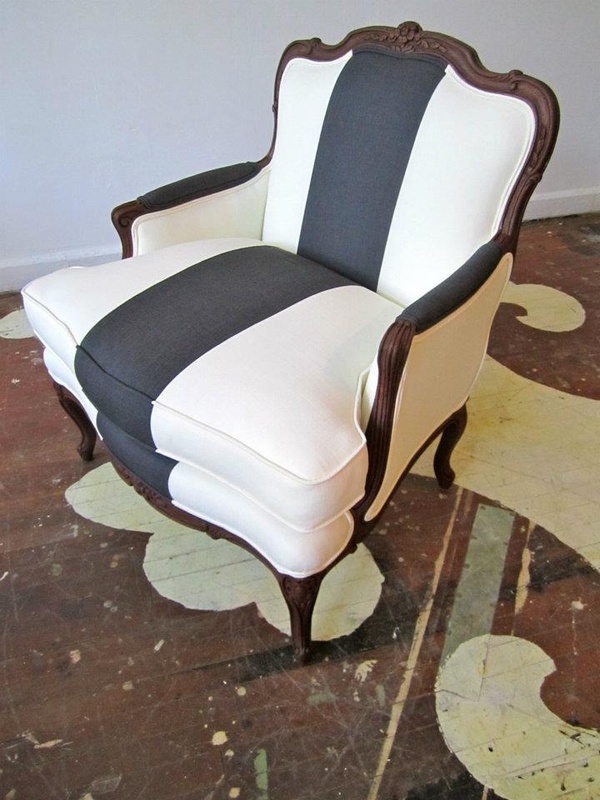 but a broad stripe on a piece of furniture? 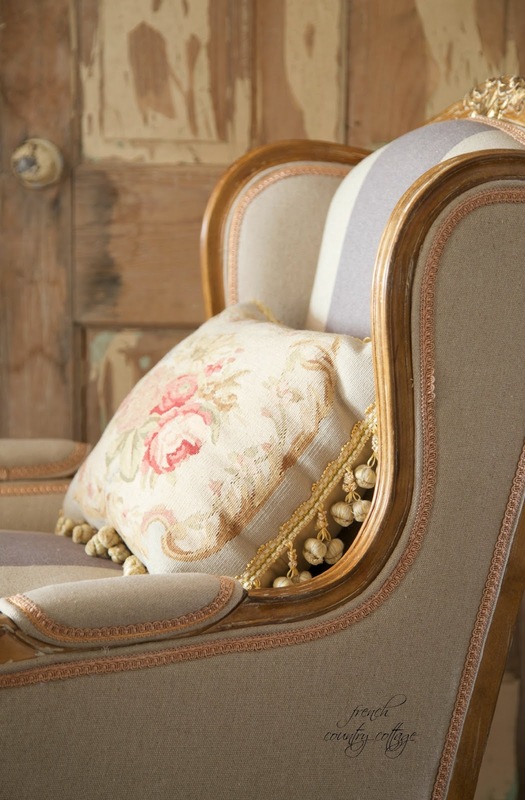 On a classic French style chair? It's not subtle and neutral. It grabs your attention and I absolutely love it. 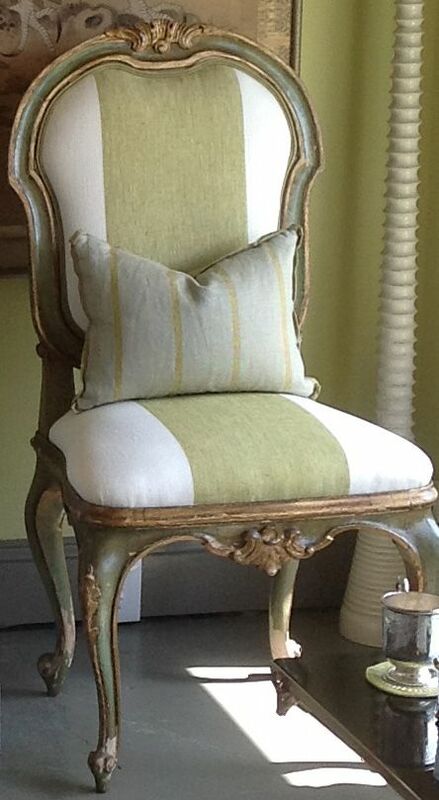 And remember the apple green floral needlepoint chairs I love? Lots of color and pattern there. What about the hutch that is covered in delicate floral paintings? that is covered in bold and charming fabric? 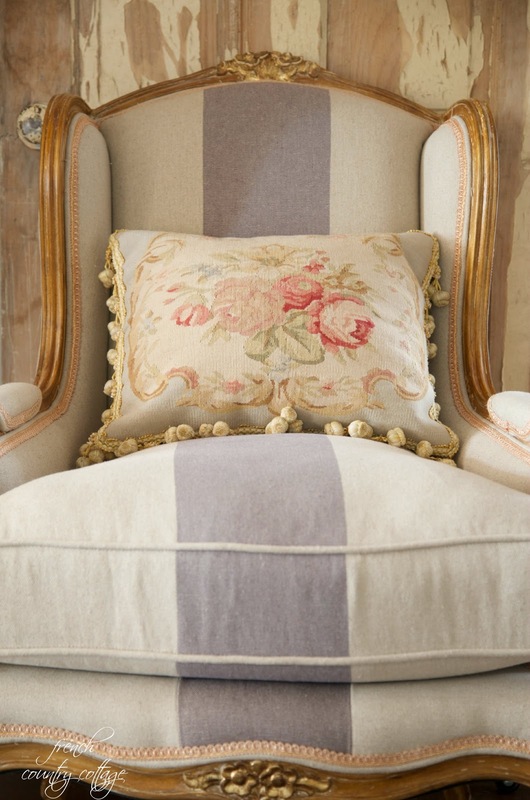 and try as I may to embrace that soft, quiet look - I love something with a little color too. If it makes you happy- it's all good right? and the more photos I took, the more I fell in love with it. It was actually reproduced from an antique that was discovered in France. Can you imagine finding a chair that looks like this in a flea market? Amazing. I really need to go on those buying trips. I have been pinning a few other favorites that you might find inspiring. 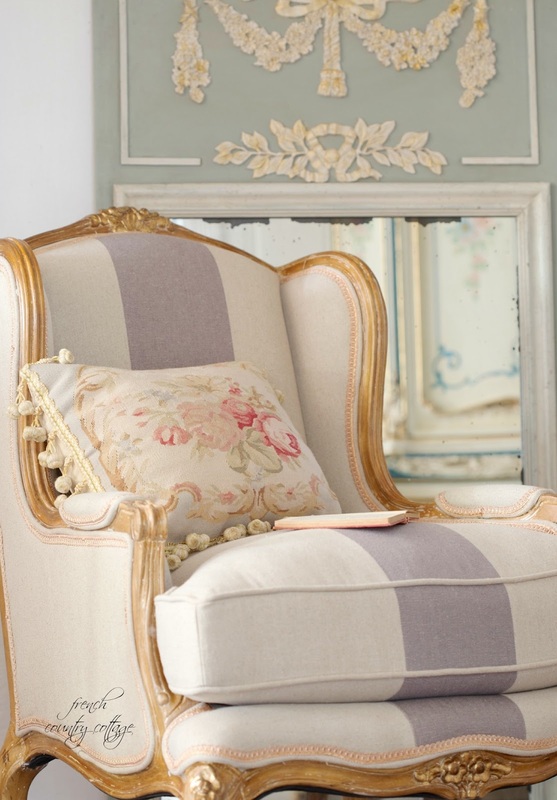 Would you fall in love with a French blue striped chair? that I am excited to get to work on. your pictures are so nice! I love your style. 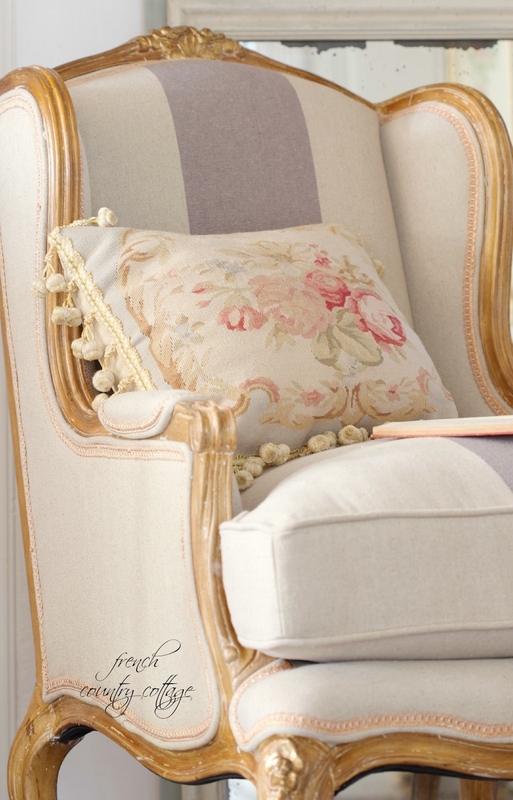 Courtney, I have been loving this chair on Soft Surroundings for a while now....beautiful! I was crushing on it it for a bit before ordering them too :) Thanks for stopping by Sherry! Oh yes! I love that chair. It's beautiful. Beautiful. I like your striped chair the best of the three, it's so soft and pleasing. Oh my! 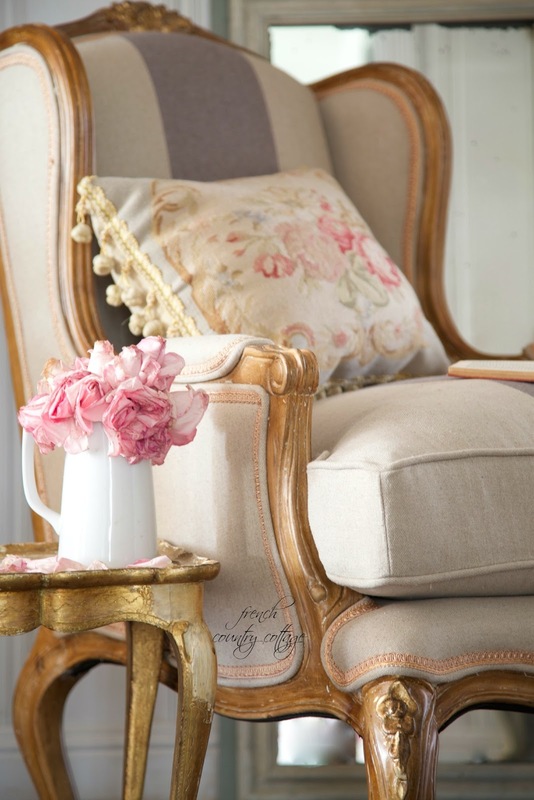 That chair makes my heart go pitter patter!!! It's definitely still soft and neutral, but oh my! I love it!!!! That chair is lovely,it isn't that far from neutral,lucky lucky you. I am so in love with the chair! 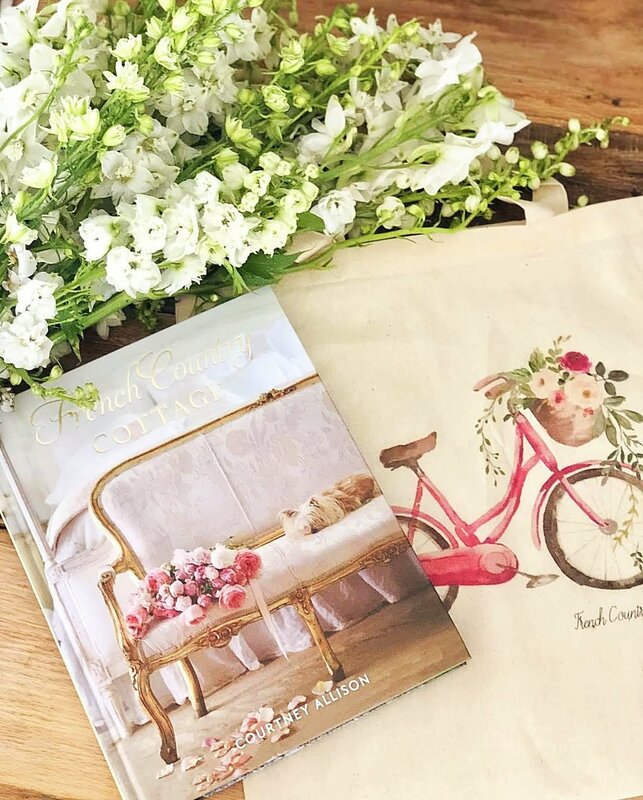 I get the Soft Surroundings catalog and really enjoy curling up with it and a cup of tea and just losing myself!! 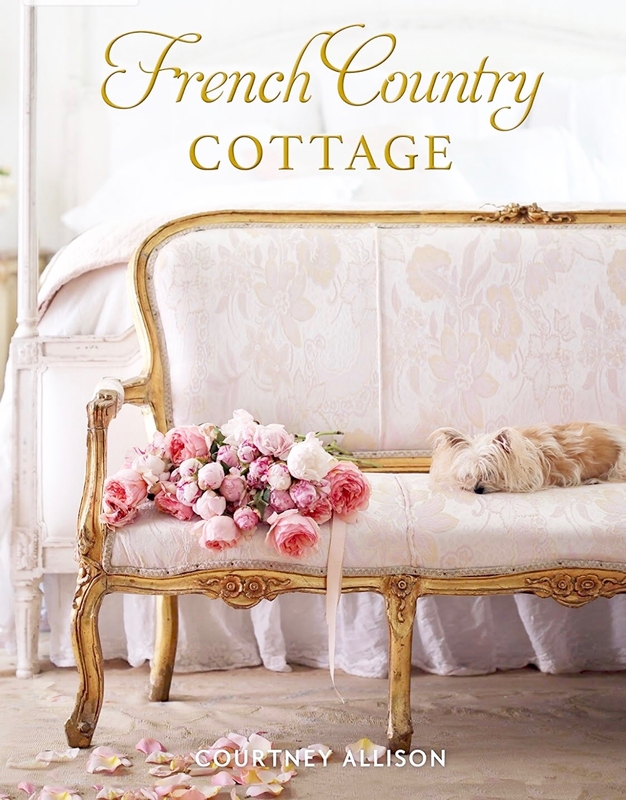 Love the Addition to your home of French pale... The strip makes a blod statement and I too have been adding stripes in the linen pillows by Ralph Lauren and gearing up to do some striped pieces. It's always so inspiring to see what you are up to. 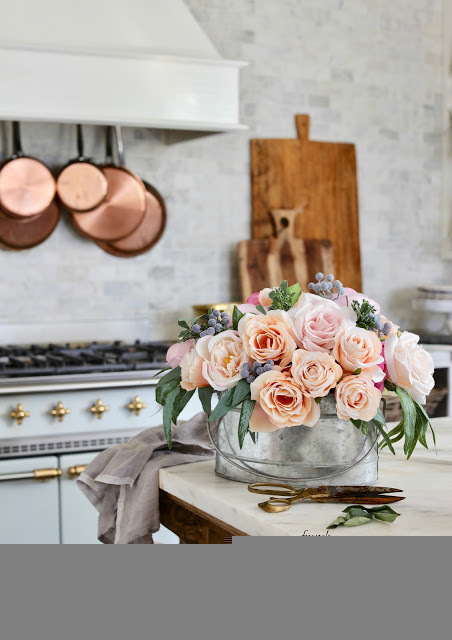 I have to mention, I had gotten away from floral prints awhile back, and stripes and florals always inspire me to want to bring a big of floral back into my home decor. It's a beautiful stage play of beauty here. I am adding some knits to my home and post. I love your style, this would work beautifully in my neutral world. I do like a pop of color (blue). Have a great weekend. 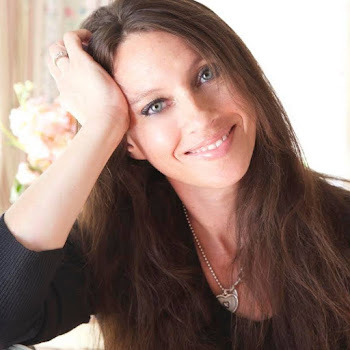 I've always loved your style and the pieces you focus on your Blog!!! I can never pick a favorite because when I see something new, I think, "That is so beautiful!!!" I've always loved blue and white anything and this chair is one piece that would be going home with me as soon as I saw it!!! I have two identical chairs and they need new upholstery. Just yesterday I talked with my husband to do it in white linen with soft gray stripe in the middle and when I saw yours, I just laughed. What a coincidence! The chair looks very nice and fits in perfectly with your style. The simplicity of your style is breathtaking. I feel as if I could sit for hours in one of your rooms and simply relax and dream. 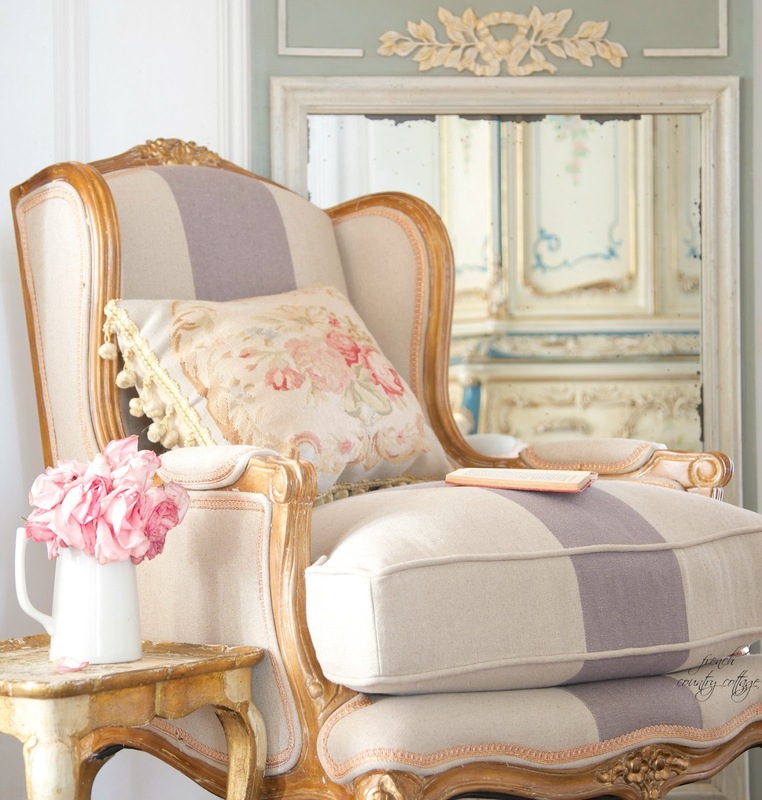 The colors you do choose for accents just make them add to the room itself. Grazie! You are an inspiration. So sweet of you- thank you Marisa! Thank you- you too Rhonda! Can't live without loads of lovely color! Love that sofa ... whoa! Just beautiful! I think special pieces like that make the room! As long as you love it it's perfect! 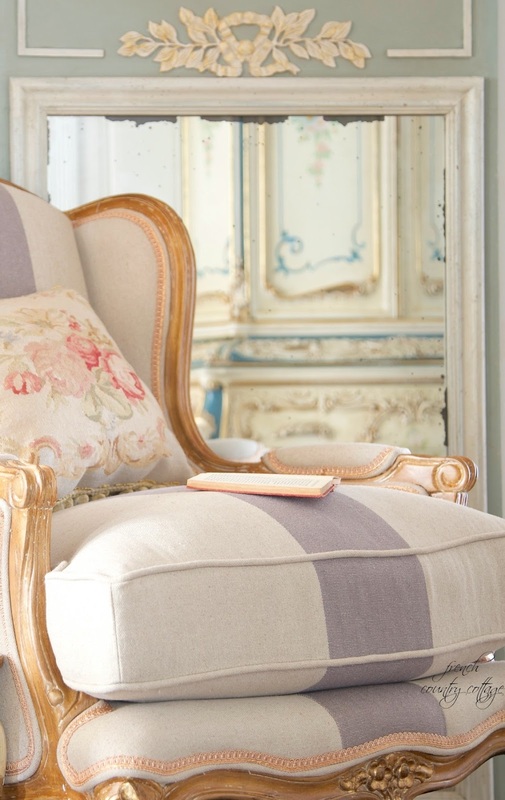 Don't you just love Soft Surroundings furniture? 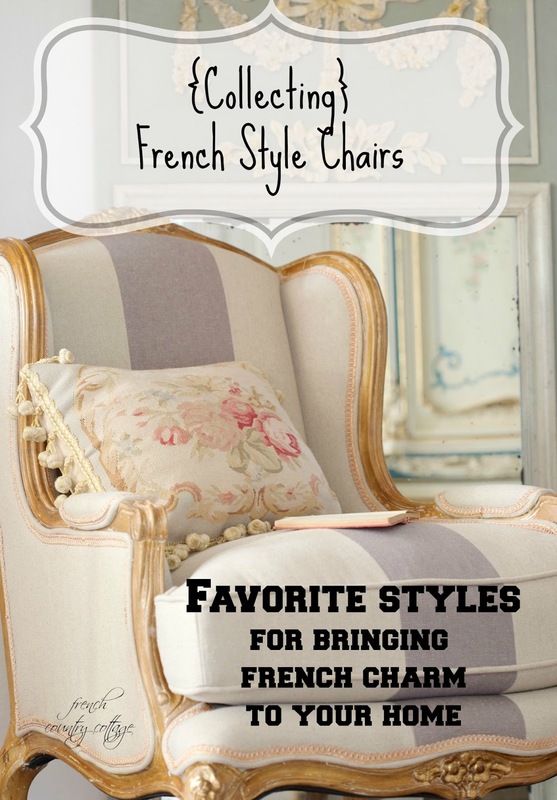 I bought two bergere chairs and I ablsolutely love them!